UPDATE: this is me admitting I was wrong, below. Majerus was not counted in the original listing, and I figured out which I missed (Jerry Slocum, Youngstown St.). I added him in below. 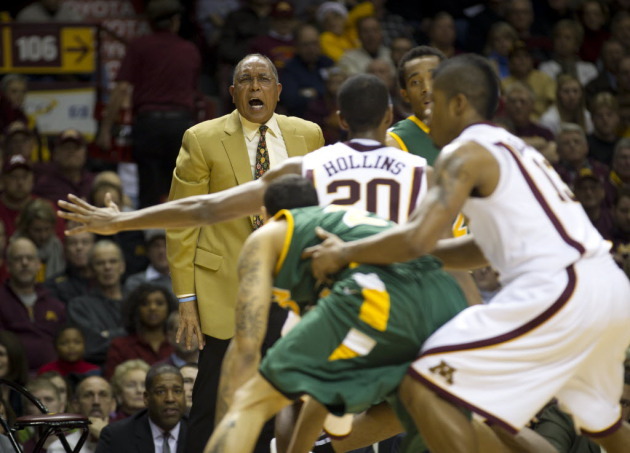 Gophers coach Tubby Smith joined elite company on Saturday, getting his 500th career win in a 71-57 victory over USC. Smith is actually the 18th active Division I coach to reach that plateau (Media has been reporting he’s the 19th, but after wracking my brain and wracking the internet’s brain, I figured out that the late Rick Majerus was likely counted in that list. Please correct me if I am wrong). Here’s the list of the remaining active coaches with at least 500 wins that I compiled, in no particular order. It was actually rather stunning to me that this list didn’t exist already, at least not that I could find. “You’re so in the moment and it’s a journey, so you don’t even look at it. Somebody tells me, and that’s when I recognize it’s 500. But it’s good to be with this group, to be a part of it because I think they’re a great group of kids, a great group to coach, there’s always a challenge with any group, but this group is a very committed group. They have good chemistry. So it’s fun to coach. “It’s all about longevity, for all of us and I think every coach would tell you that. I’ve had the opportunity to be with good programs like Tulsa, Georgia, Kentucky and here at Minnesota and I’ve been exposed to some programs that have been very committed to their basketball programs and their coaches – that’s the beauty of being at this level and not everybody has that opportunity. "This is a huge one for his career. 500 wins – how many coaches have done that? ... He’s in the history books. That just shows how good of a coach he is, how good of a person he is to transfer over to us being a winning basketball team." "It definitely felt good to help coach get that 500th win. He’s a guy that’s been around the college basketball game for a long time and he’s well-respected around the league and every day we just want to come out and play for him and make him look good." For more on how the win was won, check out my game story from last night here.